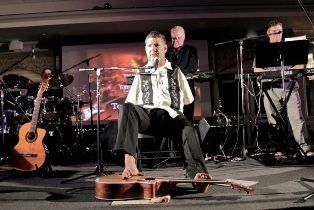 The Jesuit Center at Loyola University New Orleans presents “A Night of Hope,” a concert by inspirational Catholic musician and speaker Tony Melendez, a Nicaraguan guitarist and vocalist born without arms and with a club foot. The concert, part of Loyola Week’s Centennial celebrations, takes place Wednesday, Nov. 7 at 6 p.m. in Louis J. Roussel Performance Hall. Reserved tickets are $10, $5 for Loyola faculty, staff and students. Group tickets are also available. For tickets, visit www.etix.com. For more information, visit http://mm.loyno.edu/jesuit-center/night-hope-tony-melendez or call 504-865-2304. Despite his disability, Melendez started experimenting with different instruments in high school, including a push button organ, harmonica and guitar. Around this time, he also began writing his own songs and became involved with the Catholic Church, and even considered becoming a priest. Demand for his skills as a guitarist and composer for Masses and church-related events increased. In 1987, Melendez caught the attention of someone organizing activities for the visit of Pope John Paul II and accepted an invitation to perform for him. Since then, Melendez has traveled across the United States and 40 foreign countries, making countless television appearances, including The Today Show, Good Morning America, CBS This Morning, The 700 Club, Robert Schuller, and various prime-time network specials. He also performed at the 1989 World Series, where he sang the national anthem for the fifth game of the series. Melendez has had the opportunity to give four additional performances for the pope, twice in the Vatican and once in the pope’s homeland of Poland, and in Denver, Colo. for World Youth Day 1993. Melendez has been the recipient of numerous awards and honors, including special commendations from President Reagan, the state of California, Variety Clubs of America, Very Special Arts, the city of Los Angeles, and countless other civic and charitable organizations. He also received the first annual Inspirational Hero Award from the NFL Alumni Association at Super Bowl XXIII in Miami. In 1989, Melendez wrote his best-selling autobiography, “A Gift of Hope,” and recorded his first album, a collection of contemporary Christian songs, “Never Be the Same,” which resulted in nominations for Best New Artist of the Year from Cashbox Magazine and the Gospel Music Association. The first week of November marks Loyola Week, a series of events, activities and exhibits that celebrate the rich Jesuit heritage of Loyola University New Orleans. The week of activities will run Sunday, Nov. 4 to Saturday, Nov. 10, and is presented by the Jesuit Center and the Student Government Association. For more information, contact the Jesuit Center at 504-865-2304 or jesuit@loyno.edu.